A 14-year-old girl with a papillary-like lesion of the buccal gingiva in the lower right premolar region (Fig. 1) was referred to a private oral and maxillofacial surgery office. The lesion had been discovered by chance during a routine examination by the patient’s general dentist. The patient’s medical history was unremarkable: she did not smoke, was not taking any medications and did not report having any allergies. Intraoral examination revealed an erythematous lesion, soft on palpation, measuring less than 1 cm on the gingiva of the buccal aspect of tooth 45. No other lesion was found. An excisional biopsy was performed the day of the consultation. The specimen was immediately placed in 10% formalin solution and sent for histologic examination. Microscopic evaluation revealed tissue fragments characterized by stratified squamous epithelium overlying connective tissue stroma containing vessels of diverse shapes and sizes. The surface epithelium was undulated due to infiltration of the epithelial tissue by lymphatic vessels (Fig. 2). Figure 1: Intraoral view showing the gingival lesion on the buccal aspect of tooth 45. Figure 2: Tissue fragment characterized by epithelium with a lightly undulating surface overlying connective tissue containing numerous lymphatic vessels (hematoxylin and eosin, magnification 10×). Differential diagnosis included a histopathological evaluation to rule out verrucous xanthoma. Microscopic evaluation revealed no epithelial hyperplasia or foamy hictiocytes (xanthoma cells) between rete pegs in the upper connective tissue, which would have been indicative of verrucous xanthoma. Localized juvenile spongiotic gingival hyperplasia was also ruled out, as the microscopic results did not match the condition’s histopathology—epithelial hyperplasia, severe spongiosis and a mixed inflammatory infiltrate in the chorion. The lymphatic origin of the vessels was confirmed by the absence of erythrocytes in their lumen (Fig. 3). This information led to a diagnosis of lymphangioma. Figure 3: Higher magnification of the connective tissue showing the numerous lymphatic vessels (hematoxylin and eosin, magnification 40×). Lymphangiomas are benign malformations of lymphatic vessels.1,2 These developmental anomalies occur in a segment of lymphatic tissue that has the capacity to proliferate independently of the lymphatic system.2-4 In the oral cavity, such congenital malformations are rare.5,6 The anterior two-thirds of the tongue is the most common site of oral lymphatic malformations.2,4-9 Other less commonly affected intraoral sites are the buccal mucosa, lips, soft and hard palates, floor of the mouth, retromolar pad, tonsils and gingiva.4,6-8 Few cases of lymphatic malformations on gingival tissue have been reported in the literature. Intraoral lymphatic malformations on gingival tissues are extremely rare.5-7 Kalpidis and colleagues7 reported a case of a solitary superficial microcystic lymphatic malformation confined to the gingiva. According to these authors, this is the first case reported in the literature. 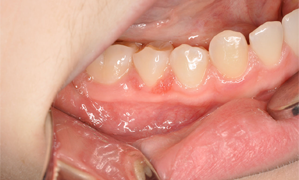 Three other cases of lymphangiomas confined to the gingiva have been described,1,4,8 but the lesions were bilateral. Although solitary gingival lymphatic malformations are rare, the case presented in this article shows that they should be an integral part of the differential diagnosis of vesicular gingival lesions. Dr. Bouchard is assistant professor in oral and maxillofacial surgery, faculty of dentistry, Laval University, Quebec City, Quebec. Dr. Avon is professor in oral medicine and oral and maxillofacial pathology, faculty of dentistry, Laval University, Quebec City, Quebec. McDaniel RK, Adcock JE. Bilateral symmetrical lymphangiomas of the gingiva. Oral Surg Oral Med Oral Pathol .1987;63(2):224-7. Soft Tissue Tumors. In: Neville BW, Damm DD, Allen CA, Bouquot J. Oral and Maxillofacial Pathology (2nd ed). Philadelphia: WB Saunders; 2002. p. 475-7. Urs AB, Shetty D, Praveen Reddy B, Sikka S. Diverse clinical nature of cavernous lymphangioma: report of two cases. Minerva Stomatol. 2011;60(3):149-53. Motahhary P, Sarrafpour B, Abdirad A. Bilateral symmetrical lymphangiomas of the gingiva: case report. Diagn Pathol. 2006;1:9.
şar F, Tümer C, Sener BC, Sençift K. Lymphangioma treatment with Nd-YAG laser. Turk J Pediatr. 1995;37(3):253-6. Aciole GT, Aciole JM, Soares LG, Santos NR, Santos JN, Pinheiro AL. Surgical treatment of oral lymphangiomas with CO2 laser: report of two uncommon cases. Braz Dent J. 2010;21(4):365-9. Kalpidis CD, Lysitsa SN, Kolokotronis AE, Samson J, Lombardi T. Solitary superficial microcystic lymphatic malformation (lymphangioma circumscriptum) of the gingiva. J Periodontol. 2006;77(10):1797-801. Josephson P, van Wyk CW. Bilateral symmetrical lymphangiomas of the gingiva. A case report. J Periodontol. 1984;55(1):47-8. Connective Tissue Lesions. In: Sapp JP, Eversole LR, Wysocki GP. Contemporary oral and maxillofacial pathology. St. Louis (MO): Mosby; 2004. p. 287-329. Naidu SI, McCalla MR. Lymphatic malformations of the head and neck in adults: a case report and review of the literature. Ann Otol Rhinol Laryngol. 2004;113(3 Pt 1):218-22. Davies D, Rogers M. Morphology of lymphatic malformations: a pictorial review. Australas J Dermatol. 2000;41(1):1-5; quiz 6-7.